This rumor never seems to go away, even after 30 years. And every time the rumor comes up, GM predictably denies it. So it goes. Now, UK car magazine, Autocar, is reporting that statements coming from GM North America president Mark Reuss give hint the next Vette may abandon its front engine layout for 2013. 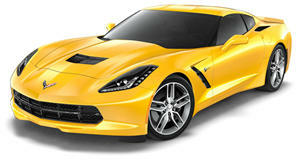 We already know that GM could be downsizing the engines for the upcoming new model, with a V6 being a possible option. Through the use of turbocharging and direct injection, power output would remain high enough to compete against certain Italian stallions. The new car&apos;s styling is still a mystery, but GM has also hinted that the classic split-window design from the 1963 Corvette may appear as an option. The interior is being handled personally by GM global design chief Ed Welburn and it&apos;s said to be "world class." Expectations are extremely high for the C7, but we&apos;re still a couple years away from its official unveiling. Until then, everything remains speculative.